With the increasing digital interconnection of things, people and places, we are moving towards a hyper-connected world. It’s estimated the number of things connected to the Internet will reach 50 billion by 2020. At the RE.WORK Connect Summit in San Francisco, November 2015, we will explore the opportunities of emerging trends in IoT as well as how we can use the huge amounts of data generated by an increasingly connected digital world. Adapting to a hyper-connected landscape and the next generation of the web will have a significant impact on how we live our lives, from smart healthcare systems, to the transport we use, to how our homes interact with us. • Danielle Cojuangco, Head of Product Design at Proteus Digital Health will explore the new era of digital medicine and wearable sensors. RE.WORK Connect is a unique opportunity to meet and interact with business leaders, influential technologists and entrepreneurs leading the IOT revolution. Previous events have featured speakers from Jawbone, AliveCor, Misfit Wearables, Google[x], Ocado, Xively, INRIX, MIT, Soofa, Jibo, BigBelly and more. View a summary of the Boston edition here. Hear from experts in IoT, the connected car, wearables, smart textiles, quantified self, smart factories & much more from the world’s leading companies & innovative startups. Explore the convergence of software and hardware, as the physical and virtual worlds collide. 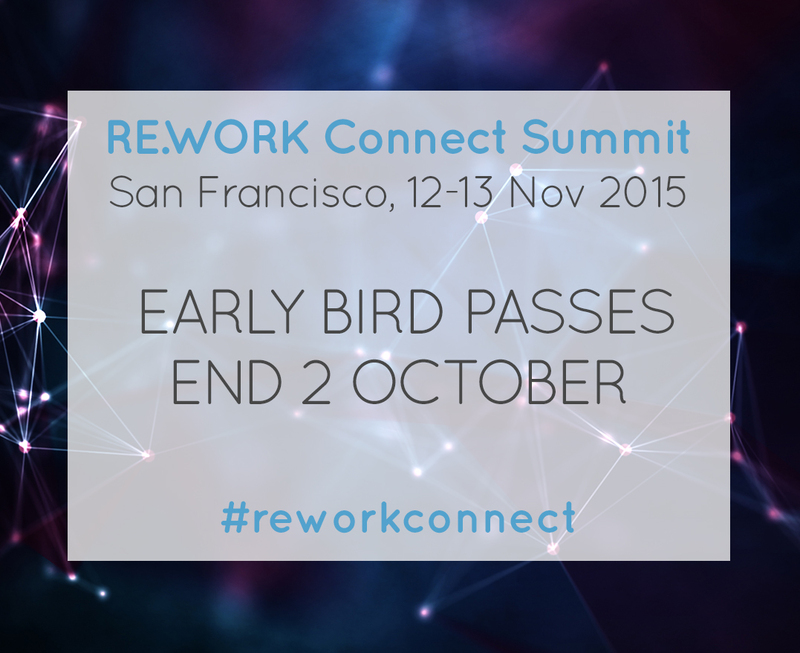 RE.WORK Connect Summit is taking place in San Francisco this November, view the event here. Early Bird price tickets are available till 2 October – book now with the 20% discount code IOTDO to save $220.